Devon Wrestling was unusual in that contestants were allowed to kick each other below the knees. They wore shoes and shin pads (gaiters) (unlike their Cornish counterparts who generally fought barefoot, without any kicking). Contestants wore canvas shirts; the aim was to throw the opponent onto his back. Contests would generally progress through heats, sometimes lasting over several days. 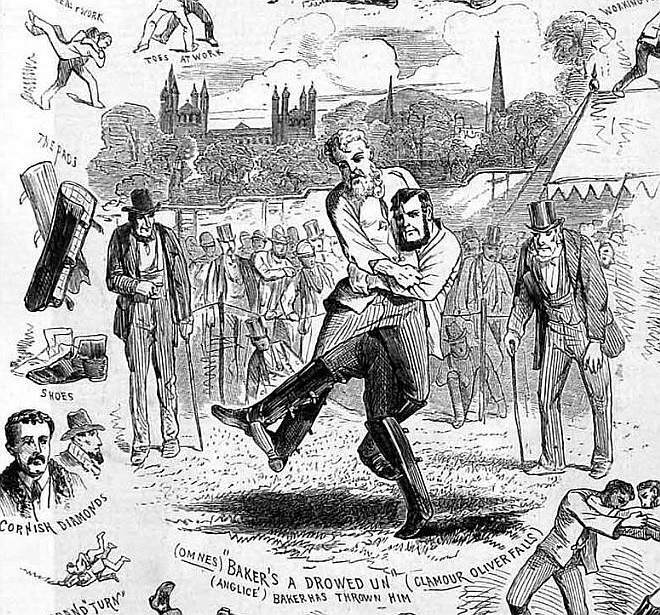 Devon Wrestling died out around the end of the nineteenth century. The most famous Devon wrestler was undoubtedly Abraham Cann (1794-1864) of Colebrooke. He was champion of Devon in the 1820’s. He ran an Exeter pub, previously called "The Woolpack", which he renamed the “Champion’s Arms”, and which he decorated with a full length likeness of himself above the door. William Wreford (1793-1866), born in Morchard Bishop but who later lived in Tiverton, was another talented wrestler of that period. Shoes and shin pads were provided. In 1855 two of the contestants were admitted to the Devon and Exeter Hospital, one with a dislocated shoulder, the other with a fractured thigh. 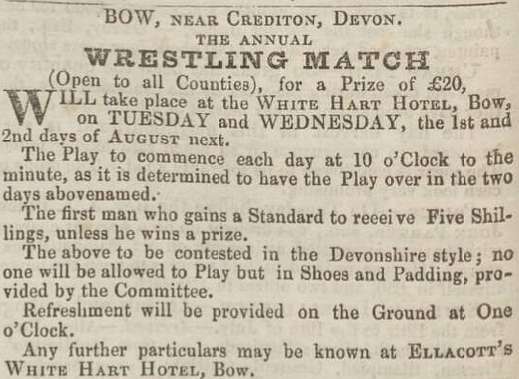 During the 1870’s Devon Wrestling enjoyed a revival; several of the wrestlers of that time were farm workers, born and brought up in Bow. 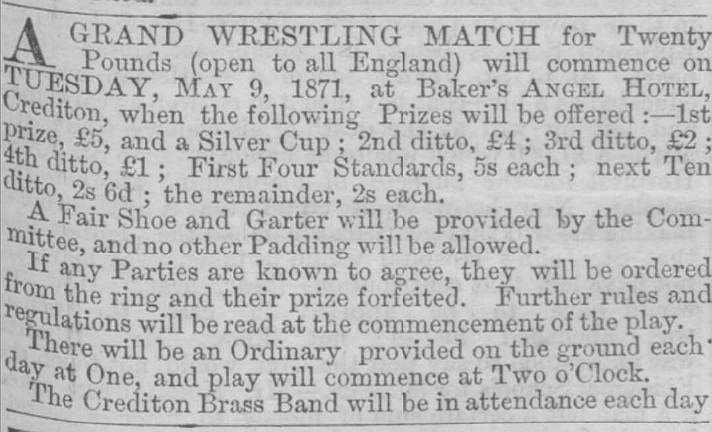 For instance in May 1870 six men from Bow competed at Exeter. Three came home with prizes. R. Baker won the first the £20 prize; young Lee, the third, Pike the fifth. William and Mary Baker ran a small farm, East Langford in Bow. From about 1863 they lived at the larger Coxmoor Farm (previously the home of William Langman). Their son Robert was born in Bow in 1846, and was to become Bow's most famous wrestler. He married Annie Honeychurch in Spreyton in 1870; they had four daughters and a son. In 1871 he became landlord of the seven bedroom Angel Hotel in Crediton, with stabling for 30 horses, (opposite the Ship Hotel) on the High Street. In May that year he staged a five day wrestling tournament, in the garden behind the hotel. In 1873 Baker beat Joseph Milton (who injured his shoulder in a fall) to win the championship belt in Exeter. That year he moved from Crediton to Exeter and managed the Foresters’ Arms in Commercial Road for five years, where he also staged wrestling contests. Later he took on the licence of “The Grapes” at the top of South Street. Robert Baker retired from wrestling after beating Richard Pike (see below) in 1879. After the death of his wife in 1881, he remarried, in 1883 to Jane Lee, a widow, of the Duke of York pub in Sidwell St. In 1887 his 14 year old daughter Catherine Jane was one of 186 people who lost their lives in the fire at the Theatre Royal in Exeter. Two years later he and his wife took over the “Teign House Inn” in Christow. He died in Christow in 1916. His brother, Thomas, was three years younger. He started wrestling when he was 18, whilst he was working on his parents’ farm. 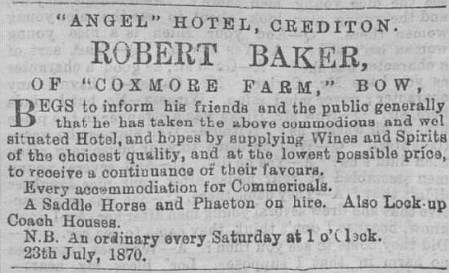 In July 1869 a newspaper report described how, on a Saturday evening, watched by several hundred persons assembled at the Burston Inn in Bow, Thomas took on William Peake, of Zeal Monachorum. Good play was shown by both men; the judge eventually gave the match in favour of Thomas Baker. This match was for 5 shillings a side. In May 1872 a contest took place at the Tradesman's Arms in Bow. Robert and Thomas Baker took first and second prizes; Rowe, Crediton, third ; and Ford, Bow, fourth prize. Thomas married Elizabeth Gibbings from Exbourne in 1875. For several years they farmed at East Risdon, Jacobstowe, but ran up debts. In 1888 they moved to Nailsea, Bristol where he ran the Butcher’s Arms. After his wife died, in 1896 he remarried and moved to his new wife’s pub, the “Ring of Bells”. The couple later separated. He became bankrupt in 1899, and died sometime after 1911. Two other noted Bow wrestlers were Richard Pike 1850-1909 and Simon Battishill 1855-1902.